Green Maca Smoothie | The easiest way to make maca root taste good! I broke the news to my sister-in-law (who introduced me to traditional foods, this great book and also happens to be an registered nurse) and she talked me off the ledge. She reminded me that I was a healthy 36 year old woman who in the past year alone, had moved 3 times (including a cross-country move), grieved the death of a loved one, bought a house, created and launched an eCourse, supported my husband through 3 job changes ALL THE WHILE running a full-time business and being the primary caregiver of my kids. Then she asked me if I have ever taken maca. 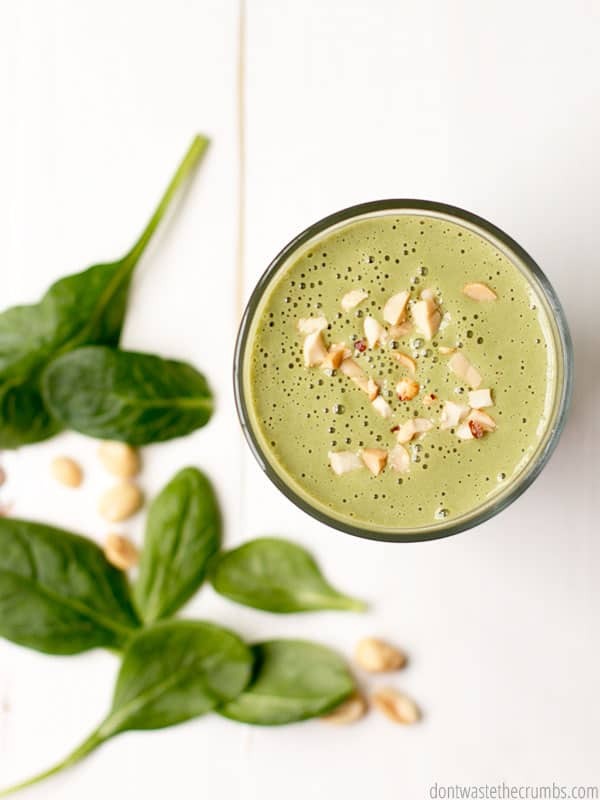 Her timing was absolutely perfect – I had JUST started making a green maca smoothie each morning for breakfast! We had a good heart-to-heart, and in the end came to a conclusion: I likely wasn’t suffering through peri-menopause. Instead, the symptoms I was experiencing – poor sleep quality, night sweats, severe mood swings, muscle spasms, poor concentration and forgetfulness – were probably because of stress. Update: I also started taking Super B (a comprehensive vitamin complex containing all eight essential and energy-boosting B vitamins), Cortistop (helps the body manage stress levels) and NingXia (a whole-body supplement) from Young Living and I’m now feeling so much better! Maca is a root plant belonging to the mustard family. It’s kind of like a beet – you can eat the leaves, but the root is where the good stuff is. There are a few different varieties of maca root – red, yellow and black – and each variety has its own unique benefits. Maca in general has a very long list of health benefits, but the reason I believe it works so well is because it’s an adaptogen. Adaptogens are a unique class of healing plants: They help balance, restore and protect the body… an adaptogen doesn’t have a specific action: it helps you respond to any influence or stressor, normalizing your physiological functions. In plain English, stress causes your hormones to go out of whack. Adaptogens plug the holes where the body isn’t making enough hormones to keep you sane and normal. I look at it like a supplement – something to help my body along as it works through the long and tiring process of overcoming stress. When I first tried maca, I spit it out. IT TASTED AWFUL. I tried it with water – gross. In a fruit smoothie – disgusting. Mixed with applesauce – nasty. I even texted my SIL again and asked how in the world she could stomach the taste of maca?! She took it in pills, that’s how… cheater. After 3 failed attempts at “disguising” the HORRIBLE taste of maca and not really wanting to encapsulate the whole bag, I did some digging and found that the taste of maca is complimented by nuts. You may or may not know, but I’m a HUGE fan of smoothies. I’ve been making them regularly for 3+ years and even wrote a book on how to make protein smoothies without using protein powder and all the junk manufacturers put in it. I personally feel SO MUCH BETTER when I start my day with a smoothie. It helps control my appetite (I’m a big snacker), fuels me with at least 2 servings of fruits/vegetables and thanks to the probiotics yogurt, it helps keep my digestion system regular. I knew I wanted to keep smoothies in my daily routine, but I thought if I tweaked the recipe a bit to include nuts of some sort, then I might be able to mask the taste of maca root. And I was right! I’ve got this recipe down to a science and burned into my brain forever. Every morning for the past three months I have been make one of these (and taking my supplements!) and not only do I feel great for starting my day off on a good note, but the maca root has REALLY helped me overcome the fatigue I was experiencing because of stress! I’m SO sold on the benefits of this smoothie, that I even took my blender with me to our extended family holiday in North Carolina over the Thanksgiving break! Picking out what type of maca that’s best for you is a bit challenging, so here’s what I did (and recommend doing). I started with gelatinized yellow maca since it’s gentler on the digestion system than raw maca. Once 8 ounce package lasts about 2 ½ – 3 months and is well worth the price. The Maca Team sells it for just $15, and this is MUCH cheaper than Amazon’s price. I also have their premium maca root powder, which is raw and a blend of red, yellow and black maca, but the flavor is a bit stronger. If you want to incorporate maca into your daily diet, I recommend starting with the yellow maca first. If you like the benefits, upgrade to the raw maca root powder. Everyone wants to know what blender I recommend and I can never sing praises high enough of my Blendtec! I’ve had it for 3+ years now and it makes a 100% perfectly smooth smoothie every time! Lastly, you can get the supplements I mentioned when you join Young Living as a wholesale member. You save 24% off retail pricing, will be part of an encouraging and education-based team and will on your way to feeling better STAT! Add ingredients to the blender in the order listed. 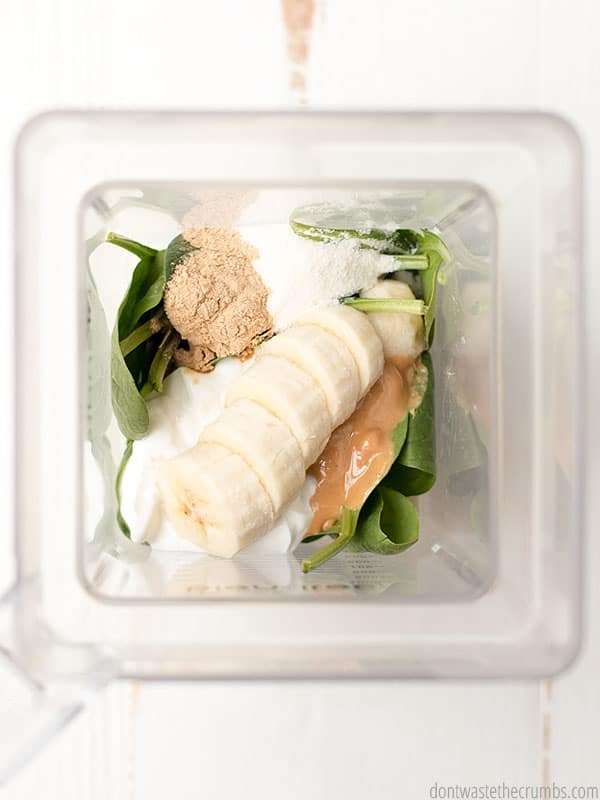 Blend until everything is smooth and well combined, using the "blend" or "smoothie" function on a Blendtec or about 1 minute on high for a regular blender. Have you ever tried maca root powder before? What has been your experience? Share your thoughts in the comments below! 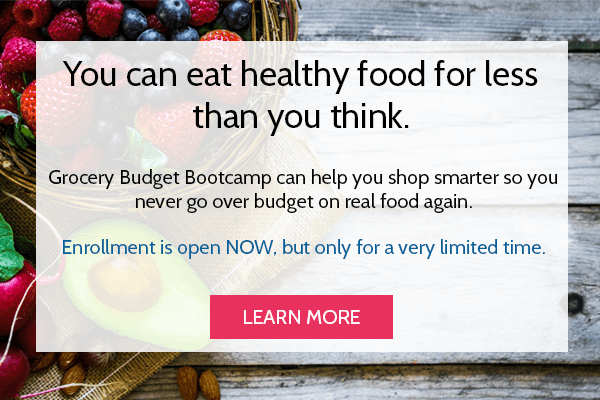 « Welcome to Grocery Budget Bootcamp! I’ve never tried maca, but that looks delicious! And seeing we’re the same age, I’ve had some of those symptoms (before pregnancy at least–and I’m sure they’ll come back even stronger!) too. I hope you enjoy your break! You deserve it! I’m stoked to try this! Hopefully this will finally get my husband comfortable drinking maca powder. I have the yellow maca from the Maca Team and I drink it mixed with water. I’m absolutely fine with the taste–I actually like it a lot! Diversifying the maca experience may be good though. Kudos to you Kaelynn! I can’t do the taste alone and given my three failed attempts, I’m not trying again, LOL! But combined with nuts? Two thumbs up!! Could I leave out the scoop hydrolyzed collagen without impacting the nutrition/effects of the smoothie too much? Thanks for this recipe! I happen to already have all of these ingredients in my kitchen, but haven’t used the maca or collagen as much as I’d planned to. I take maca capsules everyday – helped poke me back out of perimenopausal symptoms. I also have a powder that makes a nutty flavored coffee substitute. Its an acquired taste. I think the powder is pretty darn good mixed with coffee, milk and a little chocolate syrup. healthy mocha anyone? I’ll have to give that recipe a shot Jenn – thanks for sharing!! I’m having post- menopause wild moods. Hormones and nutrition is definitely off by miles! I get leg cramps…(I’m way past the ‘restless leg syndrome) so badly that I’m nearly afraid to go to sleep, and they are now affecting me when I’m up, too. I’ve been taking a good Calcium/magnesium, Vit D and zinc supplements, which worked well for quite awhile, but are less effective now. You scared me with the ‘horrible’ taste of this Maca , but I’m willing to try it. I gave up on juicing, due to the amount of mess, and time, and the sound of that machine running is like a jet engine taking off in my kitchen. How hard is this to mix, and how long does it take each morning to make and clean up after? Can I make 3 days worth at a time? I’m so tired and worn out trying to figure out my nutrient needs, with these moods swings! (And keep up with hubby’s nutritional needs and a busy life!) I do like dandelions and Amaranth nutty flavors, maybe I and hubby will like this. Since I blend maca in a smoothie, my blender does all the work and I can’t even taste it anymore. You can make 3 days worth – just shake really well before drinking! I loved this post, Tiffany! I’m getting some of the hydrolyzed collagen powder for sure! I was on the fence for a protein powder after my workouts and this one seems to be the best choice. And the maca seems to be a good “multivitamin” of sorts. Still thinking about this one. Could you do a post on your supplements you take? I’m curious how to replace some of mine me with real food supplements. Like my fish oil, natural calm, multi, etc. Awesome! I can’t wait for it! Tiffany, you are such a rockstar in this real food on a budget thing! You are now my go to site for all things food, health and frugal! 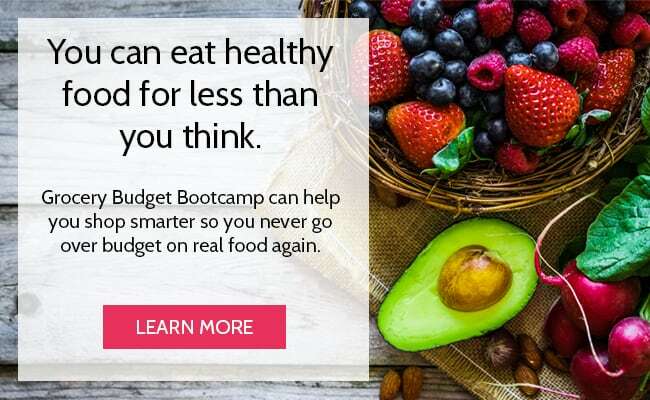 I am learning so much right now in your Grocery Budget Boot Camp! Tiffany, Can you tell me if you’ve noticed a difference in your energy levels and your skin as far as less breakouts. I’m considering weaning myself off of bio identical hormones prescribed from my natural path to just the Maca. I’ve been on them to combat minor acne and minor hot flashes due to perimenopause. I just can’t afford the prescriptions and the four other supplements that they have me on! And Maka seems to be a fit for all of those symptoms that I’m having. Thank you! I have had a bag of maca in my freezer for at least 6 months. I tried many ways to choke it down, and just couldn’t handle it. I really need to try this! I have been wanting to get either gelatin or collagen to supplement as well. Do you think the gelatin would work the same? Hi Barbara! Definitely try this smoothie! It’s the only way I can handle maca. I use collagen daily, but gelatin won’t work because it’s hot-soluble. Add it to your smoothie and bad things happen in the blender! But you can add gelatin to coffee and tea and other hot liquids. Seriously delicious smoothy! I bought Maca powder a while back and never figured out how to take it in any way that was palatable… until now! Just made this shake (minus the collagen powder; used 1/2 cup kefir rather than yogurt; added heaping teaspoon of camino cocoa powder). 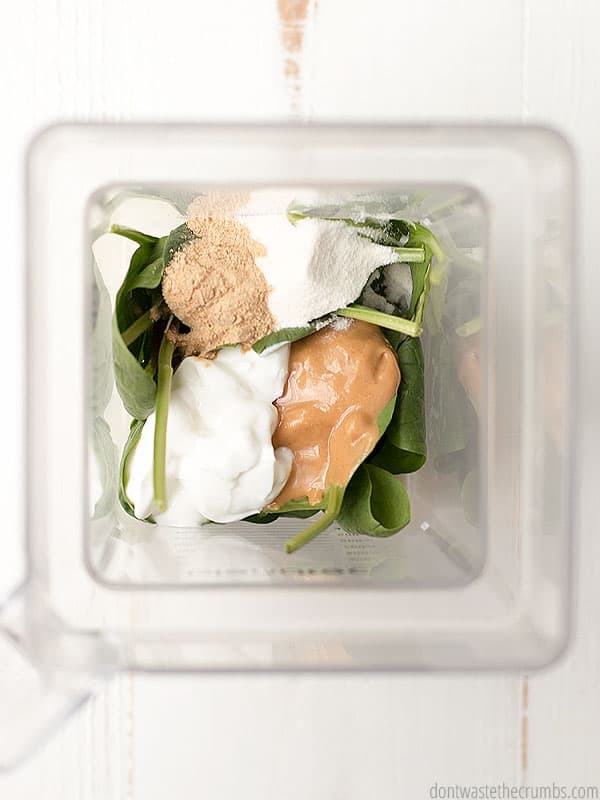 Yeah – I bought maca with holy basil and was looking for a Smoothie recipe I’m going to substitute peanut butter for almond butter and omit the yogurt . 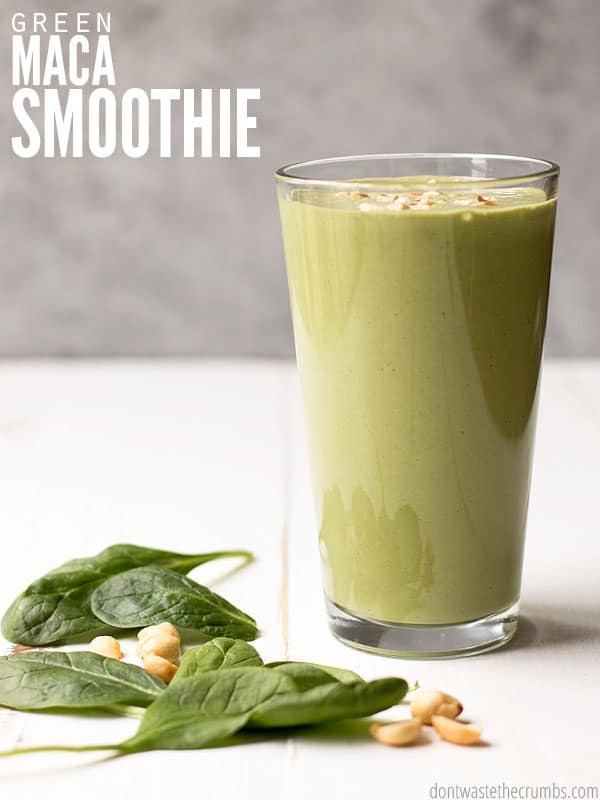 Is there a good alternative to the banana in the smoothie? I hate bananas, but I think about 90% of all smoothie recipes include them. 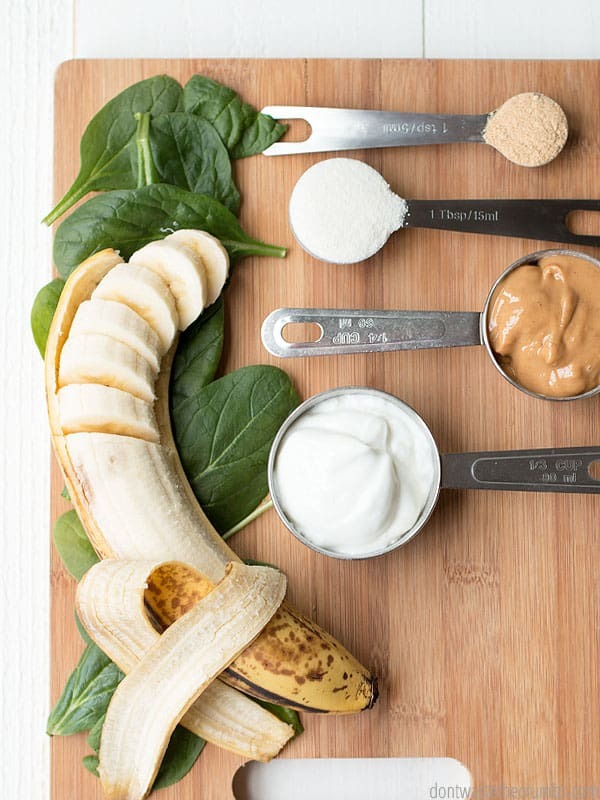 Bananas are a natural way to sweeten smoothies and make them creamy. Plus when you’re stuck with a nut flavor (b/c of the maca), they compliment it well. I’d give it a shot because I don’t think the banana flavor is prominent. If you can taste it, these options work too: cottage cheese, chia seeds, mango and pear. Just beware that I haven’t tested these options in THIS maca smoothie. I have however, tested them extensively in my smoothie eBook. Thanks, Tiffany! I’ll give it a try. And try out some of your other suggestions as well. So when you’re making a big batch of smoothies to cover multiple people and multiple days, how then do you divide it up into serving sizes? How much would you give you and your husband vs. what you would give each of your kids in one sitting/meal? Hi Sarah! Typically we give 16 oz to the adults and 6-8 oz to the kids. Thanks for this reply! Also, would you think it could be helpful to also add the redmond clay to this smoothie, or would you have reasons for not wanting to include it? You could probably include it Sarah! I haven’t, simply because I keep my clay in the bathroom and not the kitchen. 🙂 BUT, if you’re looking for a continuous detox system, this would be a great fit! Hi Julia! I’m glad you and the family liked the smoothie! 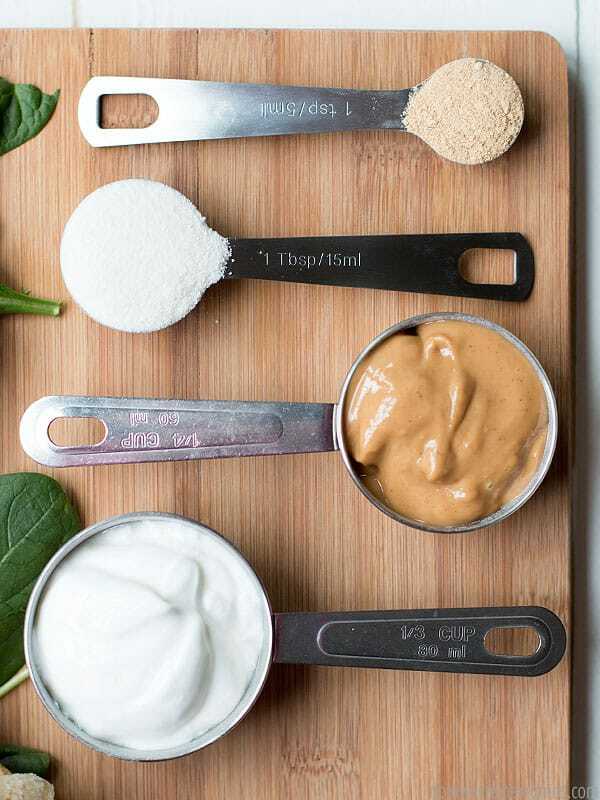 I’m not sure about kids taking maca… I’m sure a few sips or one smoothie isn’t a big deal, but I have been hesitant to make this repeatedly for my kids, w/the maca. Maca-free would be my suggestion until you’ve (or I have) done the research. 🙂 I bet the cocoa is WAY good!! I’m so glad a friend of mine showed me to your blog!! You and I are the same age, and I did the exact same thing this past year of self diagnosing Peri-menopause. I have just been on the hunt since to figure out what my body needs since my hormone levels came back normal from the doc. I’m very intrigued by the maca. Also, I read your other blog post about collagen and I have had the EXACT same experience with hair thinning after using the brand you shared. I’m very excited to purchase the Perfect Supplement brand and give that a try. =) Thank you! Hi Cindy!! Welcome to Crumbs! I can’t say that I’m excited that your hair was thinning, but I am happy that you had a similar experience as mine!! It kind of makes me feel less weird. 🙂 I have a feeling that if I got tested, my hormone levels would be normal too… it’s like the docs say you’re fine, but you know you’re not… but figuring out how to make it right is tricky! I’ve just started (as in this morning) using essential oils to support my hormones, so if that pans out, I’ll be sure to write about it! I use Maca in morning smoothie -so was glad to come in and read it may help menopause as that’s where I’m at!! I also make a maca latte during day with almond milk, maca and ginger. Lush! Tiffany, I just ordered some Collagen for my morning smoothies. I watched the video from Perfect Supplements of how to dissolve the collagen in hot liquids ( almost instantly) and in cold liquids. It looks like if you are using it in plain cold water it takes almost 10 minutes to fully dissolve. How about in a smoothie using the blender. Do you blend and drink? Blend and let set and drink? or does the blender eliminate the waiting time. Thanks in advance. Hi Charlotte! Blending eliminates the waiting time. I blend and drink right away and haven’t had any issues. Enjoy your collagen! What can be substituted for the yogurt in the recipe if you have a dairy intolerence? Yogurt offers a combination of creamy and liquid, so another piece of fruit with more liquid would work. Or you can use non-dairy yogurt for that boost of probiotics! Thank you so much for this recipe! I’ve been trying to choke Maca down for about 3 weeks now. I’d almost given up even though I can tell a difference in the way I feel when I can get it down. This smoothie is now my morning go to! Oh yay! I’m glad to hear its helping!